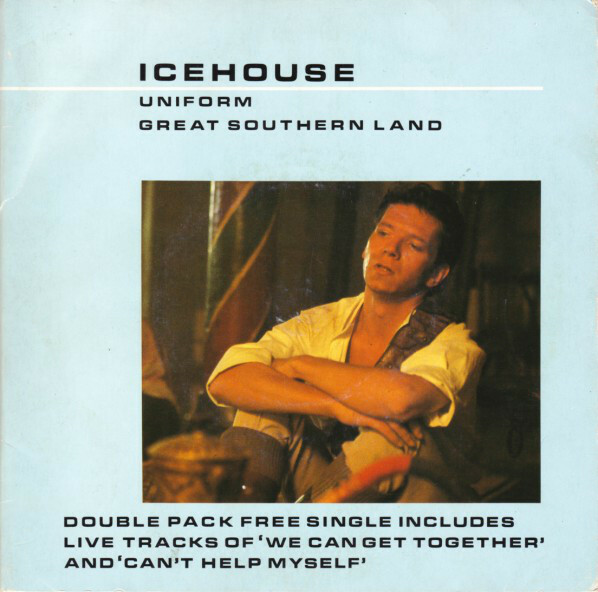 After beginning life as Flowers in Australia, only to find a Scot band using that name in the Northern Hemisphere, the group wisely chose to take the name of their debut album, Icehouse. 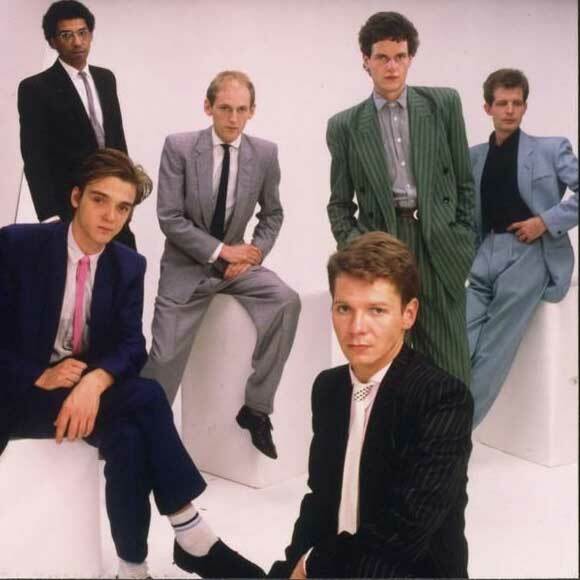 For the follow up, leader Iva Davies jettisoned most of the band and worked almost solo with producer Keith Forsey, who was a member of Team Moroder who had made a name for himself with the first Billy Idol album. there were many singles in many territories with rarities to cull from this fertile period, which saw the band cementing their popularity at home and in my Record Cell as well. 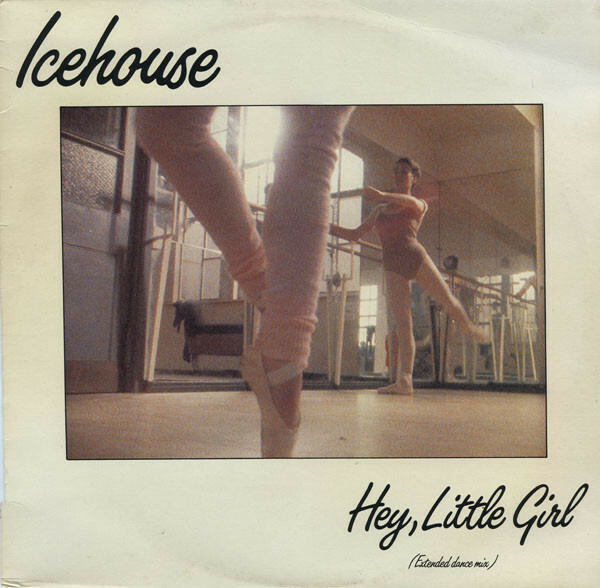 While I had loved the first Icehouse album, the second one was a huge leap forward to my ears. The chromium roxymusic finish and heavy reliance on Linn Drum and synths made this sleeker than the debut, and in the single “Hey Little Girl,” they coughed up the finest four minutes that Mr. Ferry had somehow neglected to record in his own illustrious career. But first the tail end of the “Icehouse” era must be accounted for. While Ed Thacker had remixed the “Icehouse” album for Chrysalis and the Northern hemisphere, Daniel Coloumbe had a had in remixing the lead single for America for the clubs with a pair of mixes. 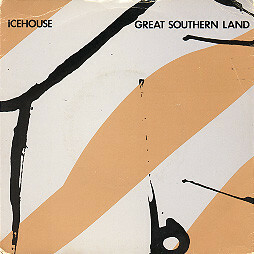 The UK was the sole recipient of the “Icehouse” 12″ single. There were no remixes [!] but two live B-sides figured on this release. One of them a rare, otherwise unrecorded John Lennon cover. The Oz anthem, “Great Southern Land” was the first single there, and the B-side was an album cut, “Uniform.” The cut first got an extended mix here, but savvier territories later got that track as an A-side, as it should have been. The best song Ferry never wrote got a Gerry Nixon remix in Oz, with a extended dub of the instro “Glam” as the B-side. 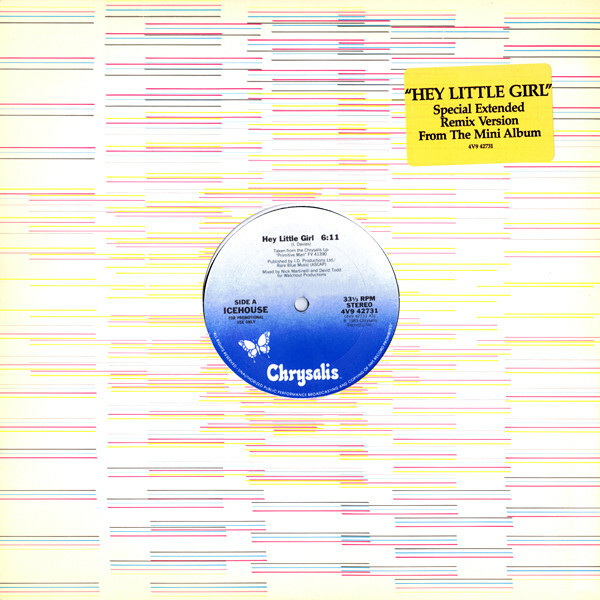 Nick Martinelli and David Todd remixed “Hey Little Girl” in the American market. 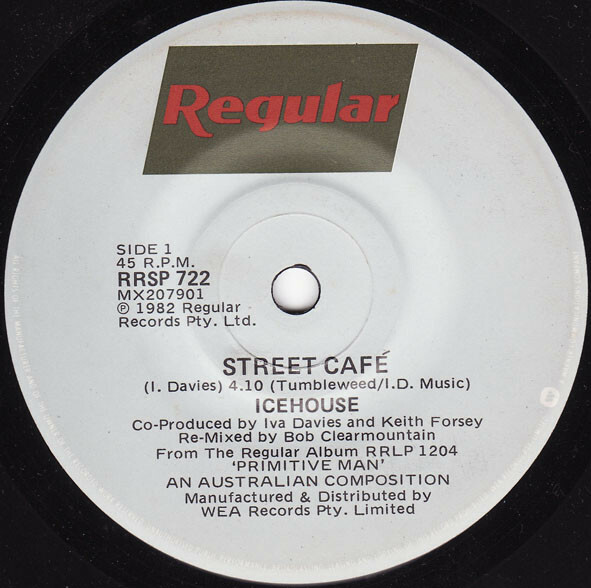 “Street Café” got just an OZ 7″, but the song was much bigger in the UK and Europe. The A-side was a Bob Clearmountain remix with a non-LP B-side that later figured on the US “Fresco” EP. In the UK, the A/B side of the OZ “Great Southern Land” was swapped, with “Uniform” ascendent as the A-side that was wasted, down under. The 2×7″ had a pair of live tracks on disc 2, and “We Can Get Together” only appeared here. While the UK 12″ of “Uniform” had the same remix as on the Oz “Great Southern Land,” it had some unique bonus tracks. The 12″ mix in German, for one. And another live cut only here. 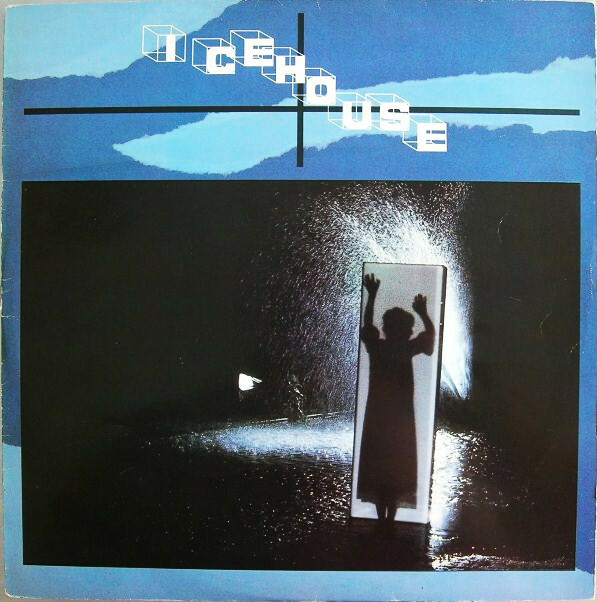 This entry was posted in BSOG, Core Collection and tagged 12" singles, 1981, 1982, Icehouse, Iva Davies. Bookmark the permalink. Just have to start by noting Monk, that although you are correct and Ferry would not wear white crew socks with a nice Anthony Price suit, he would wear white silk socks as he did on the Bette Noir tour. This was actually a point of discussion between my friends and I at the time. I have to say about Hey Little Girl, that here Davies managed to take all the best points of reference which were spinning around him at the time. Rooted in late Roxy Music, there were also nods to Bowie and Japan in both the Motorik pace and funky color of the bass and the sparse Far Eastern sounding synth stabs, respectively. Davies phrasing has quite a bit in common with David Sylvian as well. The Extended mix of Uniform is absolutely massive. Here I find a certain kinship with earlier Simple Minds. The song soars and glides above the listener. The middle section evolves into a sort of psychedelic, New Wave dub. Echorich – Good call on the Japan leanings of “Hey Little Girl.” Not for nothing did Davies poach Steve Jansen for drums on the godlike “Measure For Measure.” Due to Davies phrasing, I can vividly imagine Sylvian crooning this one. But is that because of Sylvian himself or the elephant in the room…the man called Bryan Ferry? Speaking of whom, of course Ferry worked the white dress sock action, but never in a million years would he wear striped crew socks unless it was to a game of tennis happening, and even then, I can’t quite imagine it. This was the point of my good natured jibe in Pratt’s direction. Well, we were all young and rough around the edges once! Yeah, it is kind of obvious that only Iva owned the suit he’s wearing in that pic.